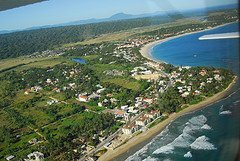 Our bustling hometown, Cabarete, is on the north shore of the DR, 20km east of the Puerto Plata international airport(airport code POP). It's a world renowned destination for water sports. Ideal conditions are blended from our prevailing trade winds and their unique thermal effect. 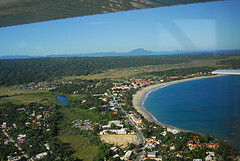 An offshore reef enhances wave action, making Cabarete so attractive for kite boarding, windsurfing and surfing. A popular wedding destination, honeymooners come for the wonderful Caribbean weather and ambiance. So do families, couples, and singles of all ages, looking the sun, sand, + surf of a perfect beach vacation. Our hometown population of around 15,000 can swell to triple that in the peak of tourist season. 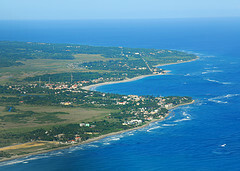 World class watersport competitions take place here, such as, The Cabarete Kiteboarding World Cup, the Master of the Ocean triathlon, Laser Sailing competitions, and even an annual Sand Castle building contest. 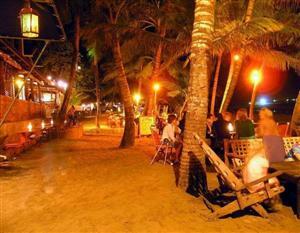 Activities available include snorkling, scuba diving, wakeboarding, canyoning, and of course, swimming. Sun tanning, with a good book, is a great change of pace if you run low on energy and need to "recharge your batteries". A 24-hr medical clinic in town caters to any medical requirements that come up. The multi-lingual staff is efficient and prepared to look after any medical concerns. Fun filled, action packed days are often followed by dining at one of the wide variety of restaurants offering dinner on the beach. The bars are hopping all night for those who have energy left to dance the night away under the stars. Casinos and discos beckon the late night crowd, with modern gaming facilities and entertainment. Vacationers often wish they could extend their stay, or just plain STAY! Some do. Others, return home and make plans to enable lengthier returns later, or even a permanent move. We did, and now it's our hometown! It almost seems surreal at times...so, who are the people in our neighborhood? An ongoing parade of nationalities from around the world. An ever-changing scenario, providing a wealth of exposure to diverse cultural insights,+ invaluable experiences. We get to meet them under the very best circumstances. Relaxed, on vacation, + in a holiday frame of mind. It's easy to fall in love with Cabarete , the beach town village that's "growing up", and absolutely has something for everyone! Come with me and check out the attractions + activities close-by, shopping, tours, restaurants and beaches in our area.